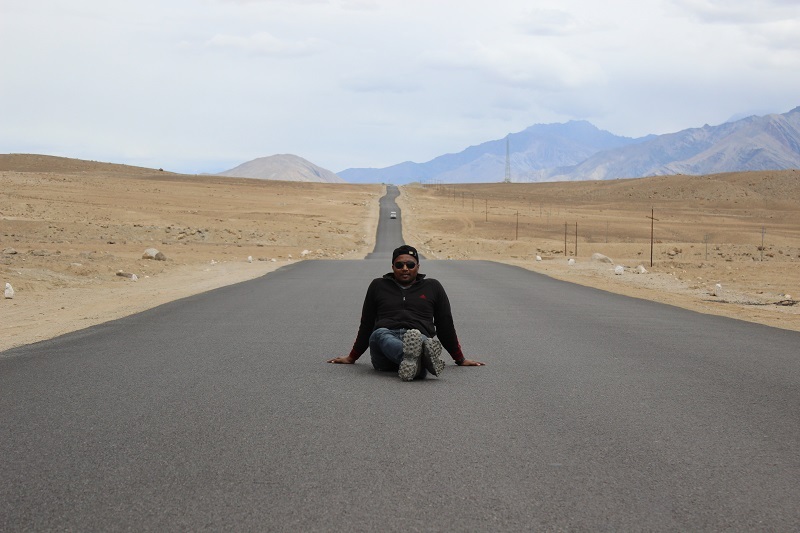 Have a spare day to acclimatize on the high plains of Leh valley ? Wondering how to utilize the day ? You, need not worry. Just wear on your tail gunner leather jacket, top-up fuel in to your bike’s petrol tank, to full and screech off on the well tarred roads of the Himalayan valley. Not to forget fill up your backpacks with lots of energy drinks and food for your thoughts as this will be a long ride. 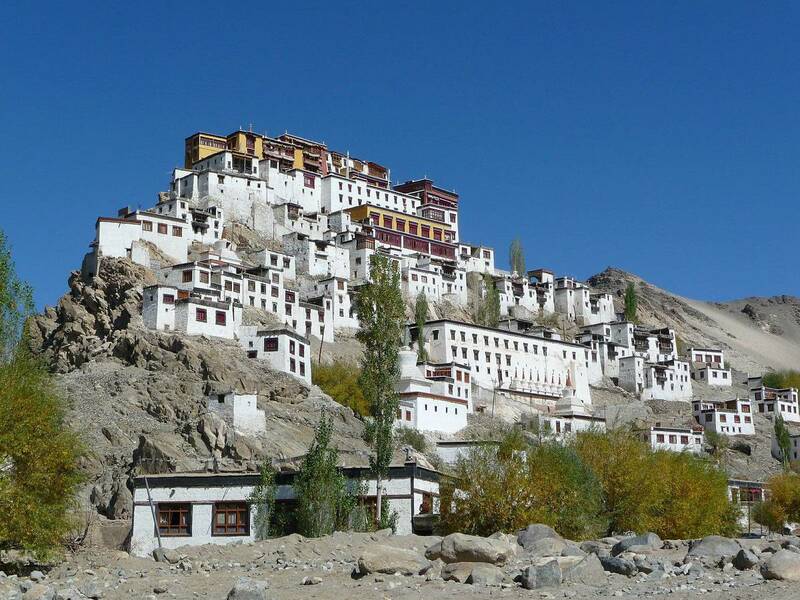 To choose from, here’s a comprehensive list of activities to do and places to visit in and around the Leh main city .We will keep Leh Palace as our base, from where we will jab on further..
Overlooking the town of Leh, this 17th century structure called, Leh palace is our first stop of the day. Modeled on the basis of the Tibet’s Potala Palace this nine storied palace was built by King Sengge Namgyal of Namgyal dynasty. It continued to be the King’s residence until 19th century when a war with other clans forced the then king to flee the palace further south to Stok Palace,Stok. Pay a nominal entry fee of Rs 15 and climb a fleet of stairs to reach the roof of the Leh Palace, to get an amazing , unhindered panoramic view of the entire Leh city. 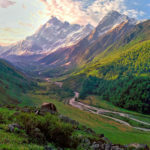 The high peaks of Mt Stok Kangri to its South and the snow clad mountain passes to its north are a great soothe to the eyes. Although the palace is now in ruins but carved entrances, few spacious rooms and elaborate corridors still exists in their autochthonous glory. The corridors have now been turned into exhibition hall which houses huge collection of ancient ornaments, jewelries, ceremonial costumes and king crowns. Photography enthusiast will definitely find this place a perfect spot to shallow their skills. Next stop is General Zorawar Fort on Skara road. Otherwise known as Riasi Fort was built by a badass general of the Sikh Empire who walked by the name General Zorawar Singh. 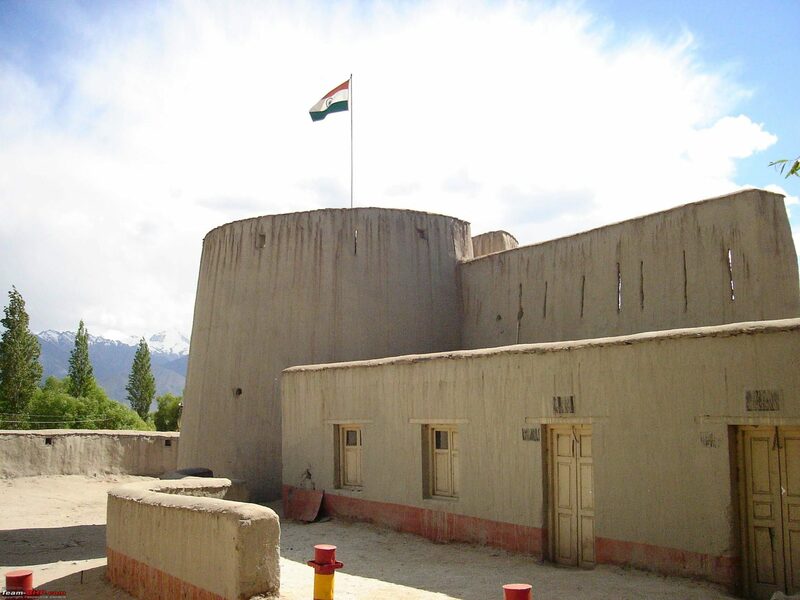 This fort, once was a base to 300 fearful Dogra mens who guarded the walls and borders of entire Ladakh region. The fort houses a natural spring and a Hindu temple within its premises. A small museum is also present which showcases some old collection of coins, stamps and other artifacts from the treasure of the ruler. Third on our stop is Shanti Stupa. 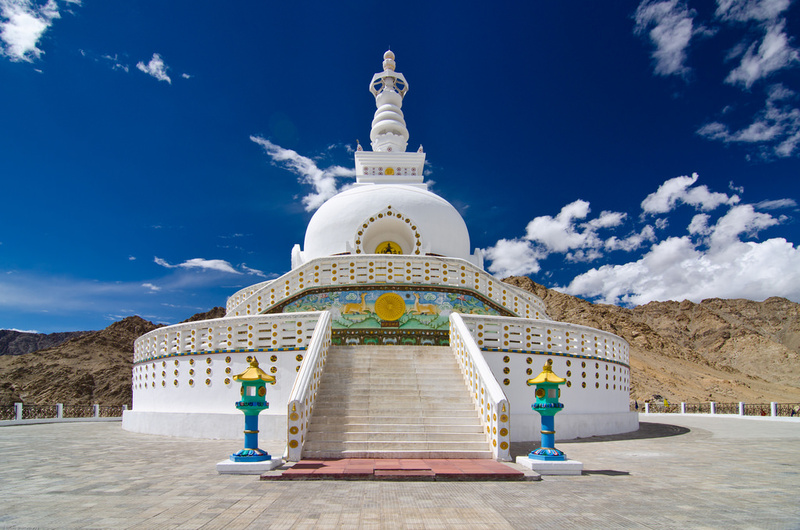 Built by a Japanese Buddhist monk, Gyomyo Nakamuraon on Changspa hilltop, it is a white domed stupa, just 5 kms away from the main city of Leh. There is a road leading to Shanti Stupa that leads to 500+ odd stairs that reach to the top of the Stupa tower. The Shanti stupa is on a rocky ridge spread over two levels. On the first level there a, idol of Buddha, and on the second level relics depicting the “birth” of Buddha, the death of Buddha (mahanirvana) and Buddha “defeating the devils” are found. 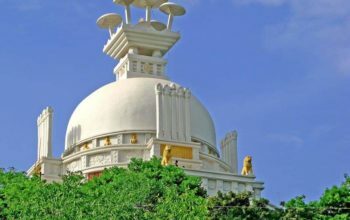 The Stupa is very famous tourist attraction for its religious significance and also due to its beautiful location that provides panoramic views of the surrounding landscape. It remains open all Day from 05:00 AM to 09:00 PM. 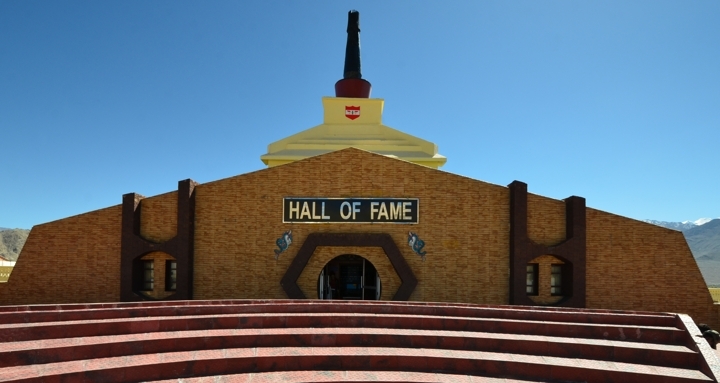 Buckle up and head towards an another must visit place on our way .It is the Hall of fame museum on Srinagar-Leh Highway. Constructed and maintained by Indian Army it showcases arms seized from Pakistani Army in the past war , biographies and pictures of brave Indian Army soldiers.There is also a gallery that is dedicated to the Sino-Indian war of 1962 that took place between India and China. The museum also has a dedicated room that displays Siachen area . There the exhibits contains apparel,equipments and amenities used by our brave Indian army soldiers to survive in such extreme conditions. Apart from this, one can also witness items exhibited that showcases the rich Ladakhi culture, its glorious history, details of the type of vegetation and wildlife found in the region .The tour to the Hall of Fame is not complete without watching a 30 minutes documentary on the bravery of Captain Vijayant Thapar (Vir Chakra Recepient) during the Kargil War of 1990. It is screened in the projection room on the ground floor and narrates the valour of our Armed forces. 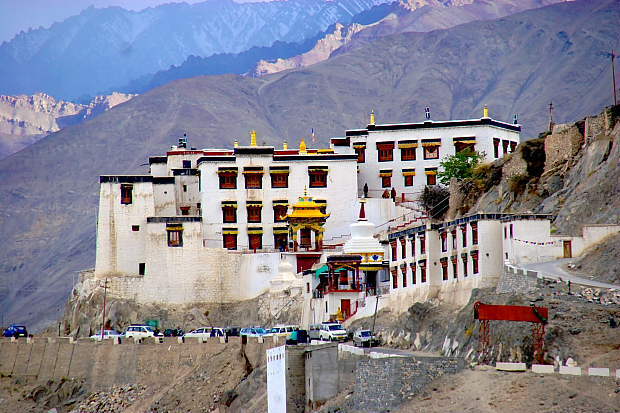 Spituk Monastery, better known as Spituk Gompa or Pethup Gompa, is a Buddhist monastery in Leh district. 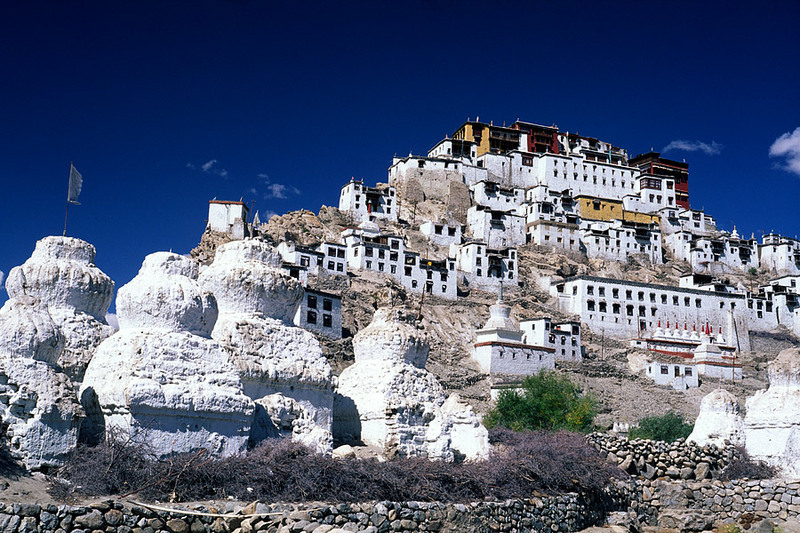 Located on the hilltop near the Indus River it is one of the most visited monasteries in Leh. Commanding an spectacular view of river Indus, this 15th Century Gompa is structured in a series of stepped tiers and courtyard.The principal statue inside its monastery is that of the lord Buddha. Within the Lord Buddha’s statue you can see a sacred image of Tsepakmed (Amitayus), about the finger length in height, which is said to be presented to King Gragspa Bumlde by great Tsongkhapa.Some rare collection of ancient masks, antique arms and thangkas(which is nothing but a painting on silk or cotton cloth that depicts Lord Buddha) can also be seen. On highway NH1D take a left turn after 2.8 kms from Hall of Fame museum to reach the Spituk Monastery. On the way up to Leh-Nimoo road Gurudwara Pathar sahib is a holy place dedicated to the first Sikh guru, Guru Nanak the founder of Sikh religion. 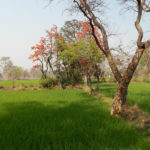 This Gurudwara is a revered place and it is believed that at this very place the Guru Nanak vanquished a demon who used to terrorize the local people. The legends says that to kill the Guru he threw down a large boulder towards the guru who was meditating at the base of a hill. Rumbling down as the boulder gained speed it touched the Guru’s body, came to a halt and softened like warm wax against Guru Nanak’s back. The Guru remained undisturbed and kept on meditating. The demon thinking of being victorious came down only to taken aback to see the Guru deep in meditation. He then in his fit of anger, kicked the boulder with his right foot.But his foot got embedded in it like in a warm wax. The demon was dumbfounded to see the impression his foot that was left in the stone and realized his own powerlessness before the spiritual power of the great Guru. felling at the feet of Guru Nanak he begged for forgiveness. Guru Sahib advised him to give up his evil deeds and leave behind his wicked ways to lead a life of a noble person. This changed the life of the demon and the legend continued. 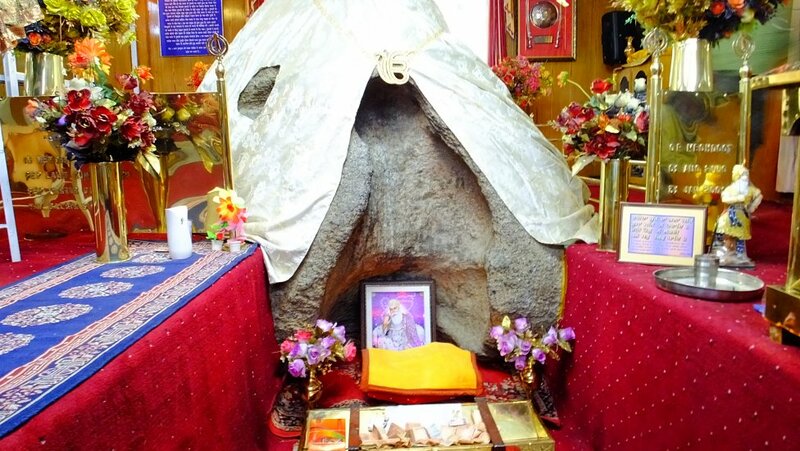 This 15th century Gurudwara houses that very boulder with imprints of Shree Guru Nanak Dev. It is also a sacred place for the Tibetan Buddhists who venerate Guru Nanak as Guru Gompka Maharaj and as Nanak Lama. This place is currently managed and maintained by Indian Army.And it is a tradition for every vehicles passing by to stop and pay respects at the temple before continuing with their journey. Pathar Sahib Gurudwara remains open from 6:00 am to 7:00 pm, all the days of the week. Leaving behind the holy Gurudwara we are now heading towards probably the most well known location of Leh-Ladakh region. 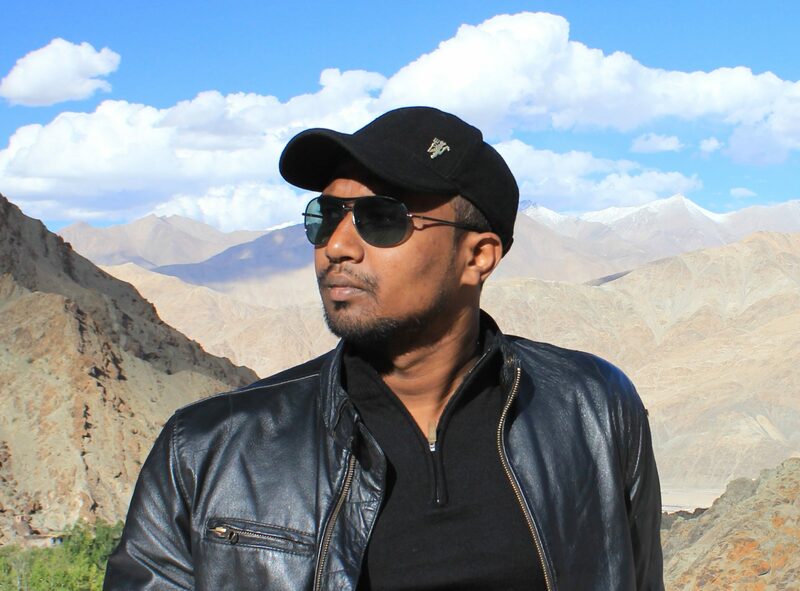 The Magnetic hills or Mystery Hills is truely a Mysterious place to be in and land of unknown natural phenomena. On this particular part of the highway, the road ahead seems to be going uphill. But, if you kill your vehicle’s engine and bring down its gear to neutral, you can witness that it slowly starts moving uphill in defiance to the gravity. Mysterious ? What is believed to be at work behind this mysterious phenomenon is a magnetic force so strong that it can pull cars uphill. The fact however is entirely different. It is an optical illusion in which a slight downhill appears to be an uphill slope because of the perfect alignment of the road and the hills in the background that obstruct the horizon ,thus giving a feel of the illusion. Nonetheless, optical illusion or not, it is still an experience just for sake of an experience. 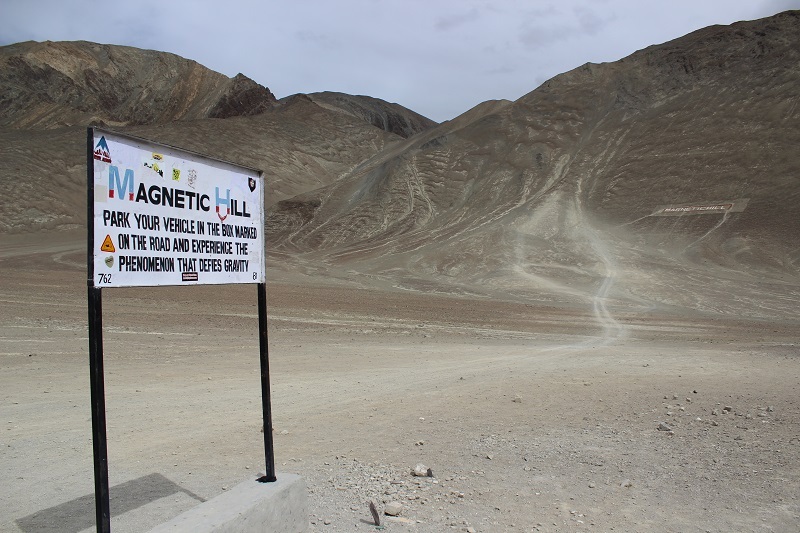 How to Reach magnetic Hills from Leh : It is at a distance of 25 kms from Leh on the NH1 Leh -Srinagar Highway . A little up ahead from Magnetic Hill towards Srinagar is the spot where two mighty rivers of India namely Indus and Zanskar rivers confluence to form another mighty Lungnak river. You can go down up to the river bed by taking a left turn form NH 1 highways to reach below the village of Purne. 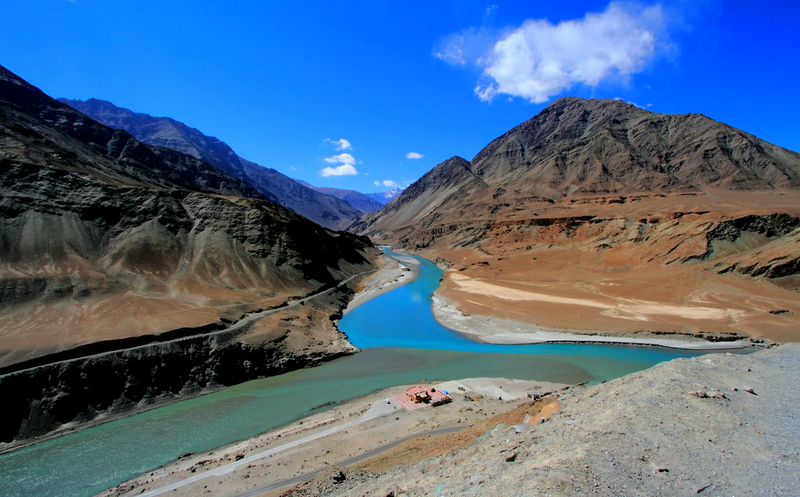 It is a nice little place where you can see the blue water of the river Zanskar and the green waters of the river Indus confluence. an absolute stunning place to spend time under the deep gorge of the Zanskar valley . There is an elevated concrete platform with ample parking space besides the confluence which has a small house that serves as the office for the many river rafting agencies who conduct adventurous activities like river rafting. This private house also acts as the end point of the river rafting and has provision for snacks and tea if you may need. Its an offbeat place which is recently been in news for an alternative and radically new way to store water for the summer days in the otherwise water parched region of Leh and Ladakh region in the form of Ice Stupas. 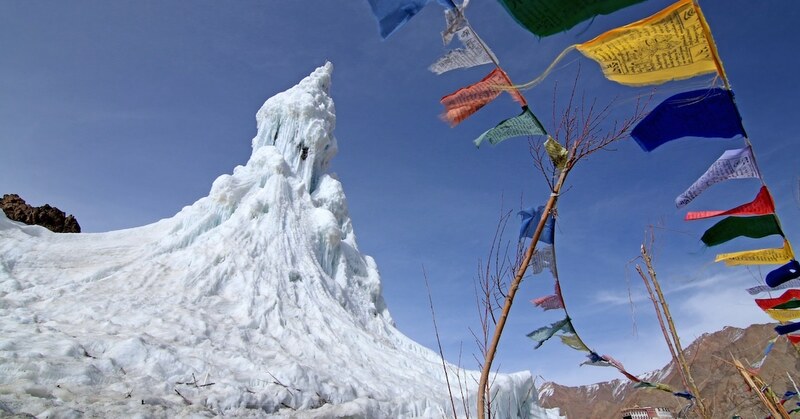 This ice stupa is a brain child of Sonam Wangchuk a mechanical engineer and founder of the alternative school SECMOL. 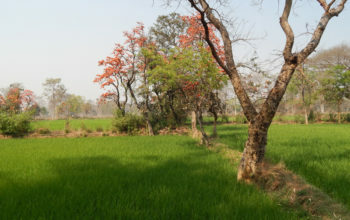 It was he ,who came up with a brilliant idea to conserve and utilize water for the dry seasons. The water is piped down from high above the mountains and is sprayed across a pre built structure filled with seabuckthorn branches. The sprayed water droplets freezes naturally in the nights and forming layer by layer it takes up a conical form. The frozen ice stupa keep the water and when the summers comes it gradually melts down. Thus meeting the needs of the locals farmers with their irrigational water needs. The highest ice stupa formed in this method was of 65fts which held the world record as the largest man made ice structure. For his cunning ideas to judiciously use water Sonam Wangchuk was awarded Rolex award for water conservation. Worth a visit and to appreciate the efforts done by Sonam Wangchuk and volunteers. The Shey Palace is located on the top of a hillock which overlooks the Shey village .A sandy trail to the left of the Leh-Manali highway connects the palace with the highway. Shey palace was built in the 16th century by the then 6th King of Ladakh, Deldan Namgyal. The village Shey from which this palace derived its name, served as the summer retreat home for the royals. However this palace was abandoned after the persistent invasion by the Dorga forces of General Zorawar Singh. The royals were then forced to moved uphill at a place called Stok. The Stok village now houses the Stok Palace which is located some 14 kms from the present Shey Palace. The Palace is presently a historical monument and is maintained by the Archeological Survey of India. The king Deldan Namgyal also built a monastery adjacent to the Shey palace. The Shey monastery, is popular for the statue of Shakyamuni Buddha, which is known to be the only image of its kind in Ladakh. The statue of Shakyamuni Buddha is 7.5 m high .Made up of copper and brass the whole statue is gold plated, with gems and precious stones studded on it. Quite an awe inspiring view for us . How to reach Shey palace : Shey palace is at a distance of 15kms from Leh on Leh manali Highway .